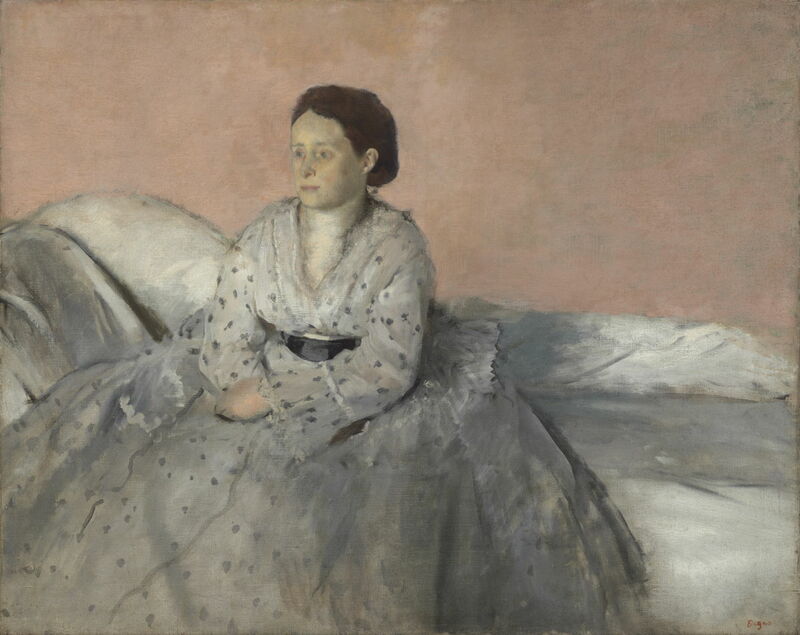 Edgar Degas (1834–1917), Madame René de Gas (1872-73), oil on canvas, 72.9 x 92 cm, The National Gallery of Art (Chester Dale Collection), Washington, DC. Courtesy of The National Gallery of Art. 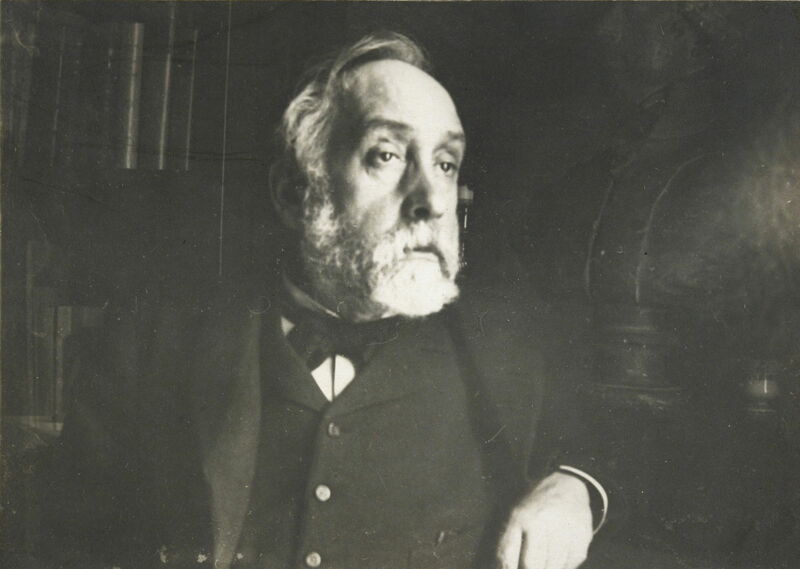 Exactly one hundred years ago today, 27 September, Edgar Degas died in Paris. Over the last few weeks, I have published a series of articles looking at his life and key works, small selections of his works by theme, and related topics. Those articles are listed at the end for convenience. Degas was remarkable among the core French Impressionists for working in almost all the genres. During the first decade or so of his career, he primarily painted narrative works (‘history painting’), after which he focussed his attention of scenes of modern life (‘genre painting’). About 7% of his total output consisted of landscapes, and he even came close to the occasional still life (Madame Valpinçon with Chrysanthemums, 1865). So far, I have shown few of his portraits, which form the body of this article. 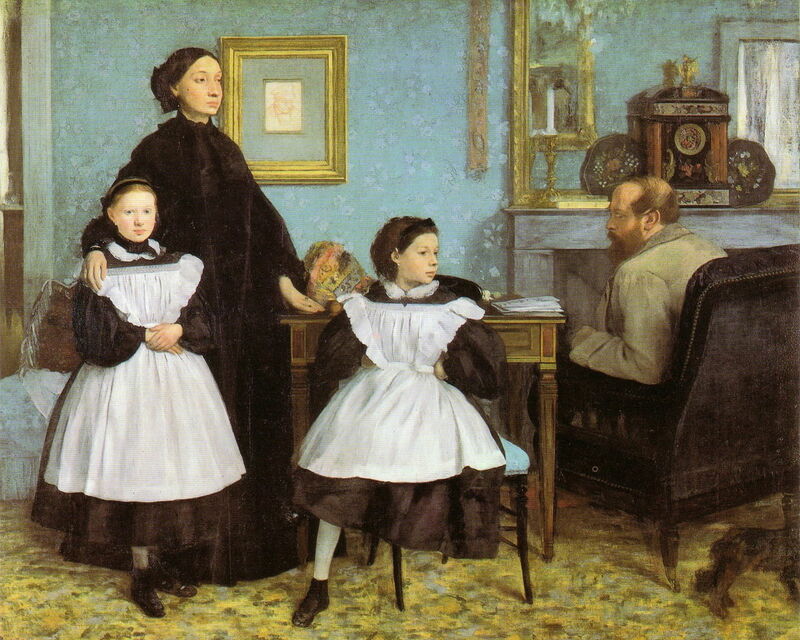 Edgar Degas (1834–1917), The Bellelli Family (1858-67), oil on canvas, 200 × 253 cm, Musée d’Orsay, Paris. Wikimedia Commons. Degas painted some small portraits early in his career, but his first major work in this genre is The Bellelli Family, which he laboured over for nearly ten years between 1858-67. It is generally accepted as being one of his masterpieces. The family shown is that of his aunt Laura, her husband Baron Gennaro Bellelli, and their daughters Giulia and Giovanna. Also featured in the framed portrait behind Laura Bellelli is her father (Degas’ grandfather), who had recently died – hence Laura appears in mourning dress. There are numerous commentaries on this painting which refer to the relative detachment of the father from the close group of his wife and daughters, the dignity and austerity of Laura, and the involvement of her husband in business, as signified by his position at a desk. Degas’ preparations for this painting were protracted and deep, with many sketches and studies, and a separate oil painting of Degas’ two cousins, completed in about 1866. My next selected portrait is of another family member, this time painted when Degas visited his relatives in New Orleans. Madame René de Gas (1872-73) shows his first cousin and sister-in-law Estelle Musson Balfour de Gas, who like the artist suffered from deteriorating vision, a condition which he had started to notice in himself only the previous year. However, by this time Estelle was almost completely blind. I find this one of Degas’ most moving paintings, with its tender, muted tones and colours. Estelle’s unfocussed stare and her visually plain surroundings show his deep empathy with her situation, and the realisation that one day he too would undergo the same. Edgar Degas (1834–1917), Portrait of Edmond Duranty (1879), gouache with pastel on linen, 128 x 128.6 cm, Burrell Collection, Glasgow, Scotland. Image by Rlbberlin, via Wikimedia Commons. Degas’ Portrait of Edmond Duranty (1879), unusually for him painted in gouache with pastel on linen, is a complete contrast. Duranty was a friend, novelist, and art critic. What could be more appropriate than filling his portrait with the man, his books, and papers? Duranty is clearly thinking over the next piece of writing, which could have been as influential as his essay The New Painting, published in 1876, and often used as a benchmark against which to compare Degas’ work. This painting was shown at the fifth Impressionist Exhibition in 1880, where it attracted enthusiastic reviews. Edgar Degas was not an avid painter of his own portraits, but I have chosen two which may give some insight into Degas the man. 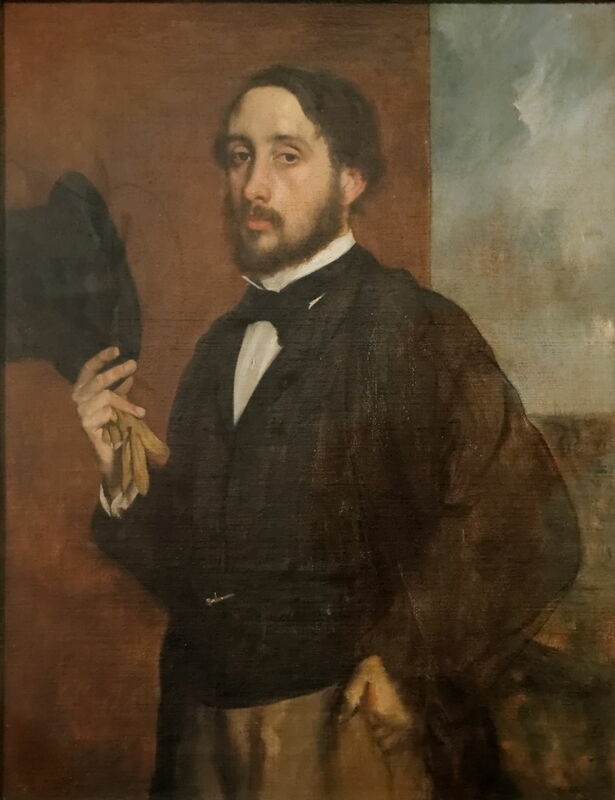 Edgar Degas (1834–1917), Self-portrait, or Degas Greeting (c 1863), oil on canvas, dimensions not known, Museu Calouste Gulbenkian, Lisbon, Portugal. Image by Yelkrokoyade, via Wikimedia Commons. The first, also known as Degas Greeting dates from about 1863, when he was almost thirty, and an aspiring history painter. With his high forehead, he has an air of cool omniscience and inner mystery. Edgar Degas (1834–1917), Untitled (self-portrait in library) (1895), gelatin silver photographic print, 11.9 x 16.7 cm, Harvard Art Museum/Fogg Museum, Cambridge, MA. Courtesy of the President and Fellows of Harvard College, via Wikimedia Commons. 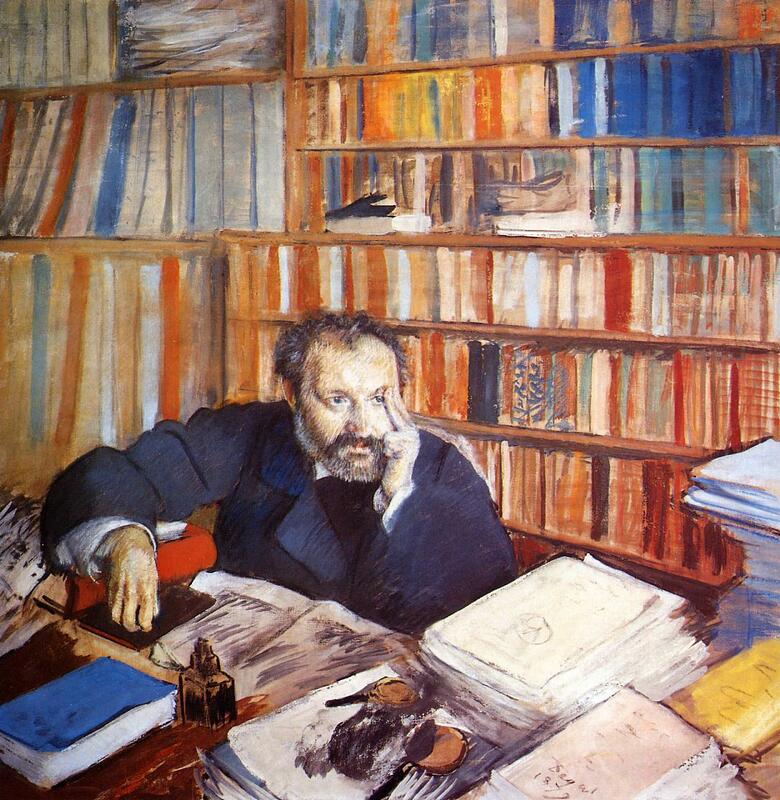 This photographic self-portrait, taken in his library in 1895, when he had turned sixty, shows the artist at the other end of his career, as if gazing back into his many remembered images. Over those thirty years, though, his dress has barely changed. I have also not mentioned his sculpture, something which he kept almost secret. 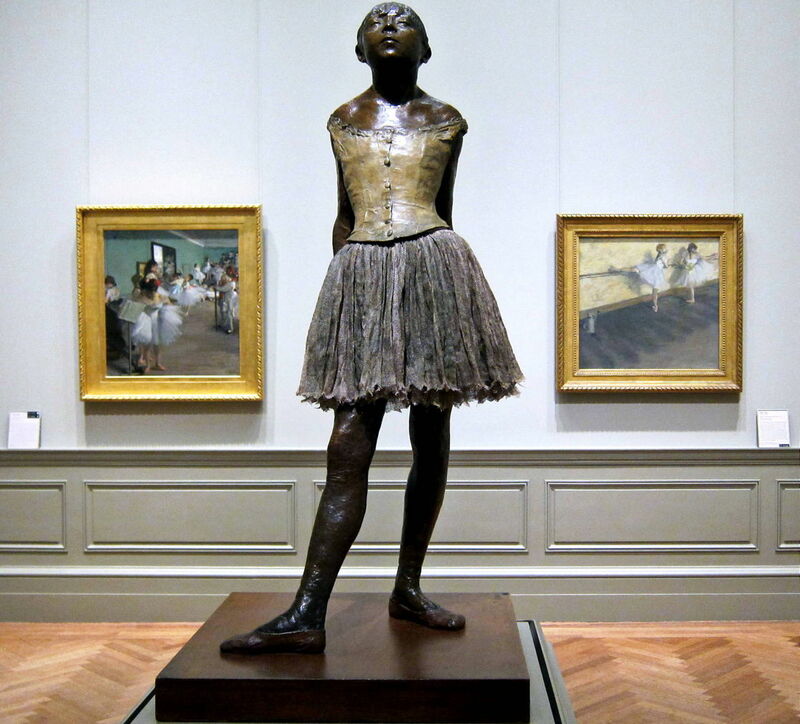 Edgar Degas (1834–1917), The Little Fourteen-Year-Old Dancer (1881), sculpture, cast in 1922, Metropolitan Museum of Art, New York, NY. Wikimedia Commons. The one sculpture which he did exhibit was The Little Fourteen-Year-Old Dancer (1881), which was denounced by even his most appreciative critics as being ugly, when shown at the sixth Impressionist Exhibition in 1881. After his death, some 150 wax sculptures were found in his studio: women bathing, dancers, and more. 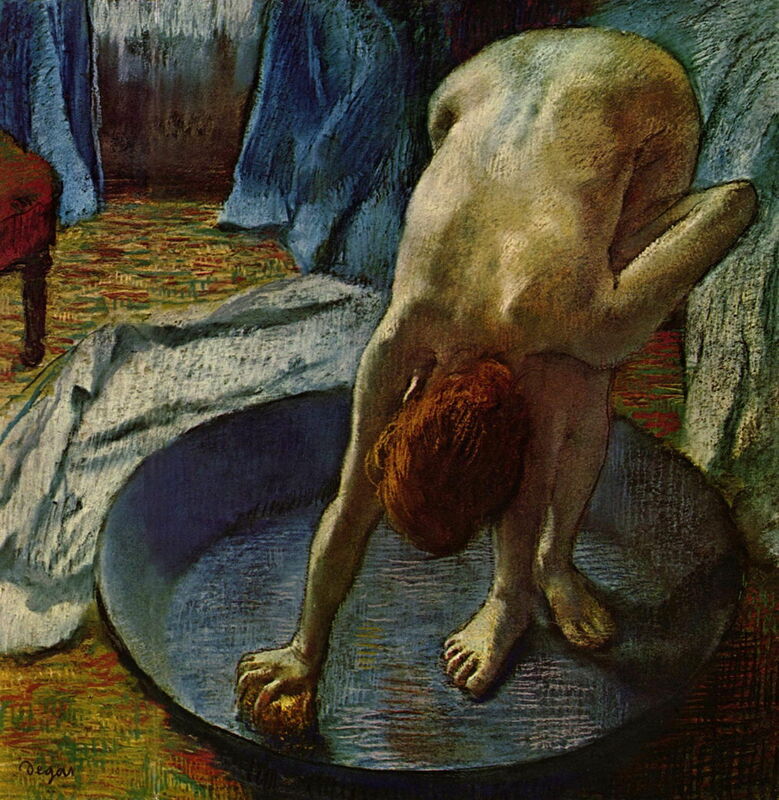 Degas’ life and work were riddled with enigmas and contradictions. He didn’t paint ‘impressions’ like the other French Impressionists, and was always concerned first and foremost with form, far less with colour. Except in his landscapes, of course, where form sometimes melted away altogether. He also used colour ‘harmonies’ and contrasts in many of his paintings, usually with great subtlety. He abandoned narrative painting for depictions of ‘modern life’, apart from those works which continued to tell stories, some of which were unresolvable puzzles. He learned formally to paint in oils, but for many of his works laboriously removed the oil and diluted the pigment in turpentine. He revived the art of the monotype, only to finish many of those prints with pastels. He never married, nor even, as far as anyone can tell, had a romantic relationship, but his work is almost exclusively of women and about women. 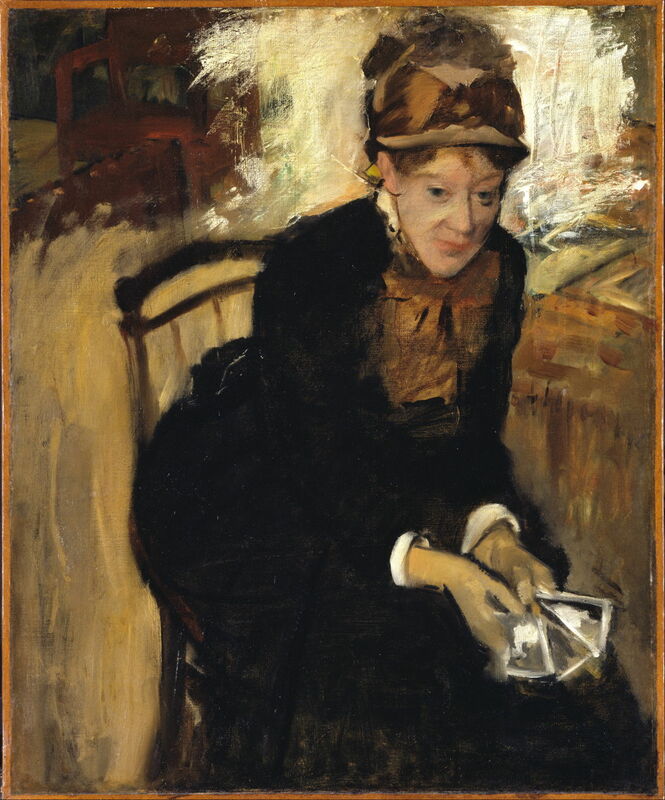 Although the Degas myth claims that he was a misogynist, he gave unstinting help to three of the great women Impressionists, particularly Mary Cassatt. His paintings also give unusually perceptive insights into the hardships which many women had to face at that time. Finally, which four of his paintings would I want to remember him by? The first is undoubtedly his portrait of Madame René de Gas (1872-73) above, which I think is one of the most tender and moving portraits of the century, and stands alongside those of the great Masters of the past. The second is The Dance Lesson (c 1879), as a succinct summary of his many highly original paintings of the ballet, with its disembodied figures, form, movement, and the difficulties which the dancers had to endure. The third is Waiting (c 1882), one of his most puzzling paintings, which brings together dancers and the ‘modern woman’ in a riddle which has no solution. One of his simplest compositions, it is also one of his most memorable images. The last is Woman in a Bathtub (c 1886), one of his most perfect statements on form, executed in vibrant textures of pastel. 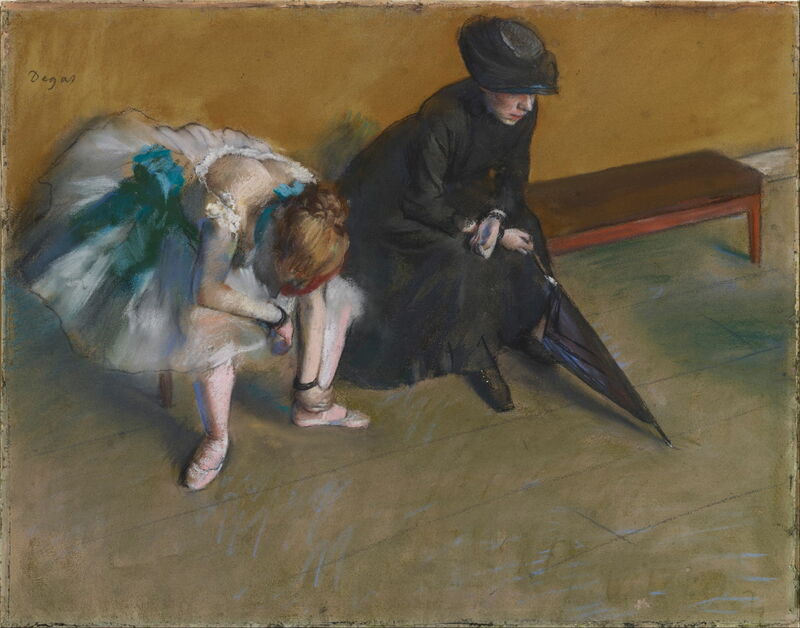 Degas’ art is the very antithesis of the ‘impression’: meticulously crafted through sketches and studies, it shuns the momentary sensory rush for a sustained and profound fascination. It never disappoints. Posted in General, Life, Painting and tagged Cassatt, Degas, Impressionism, painting, portrait, vision. Bookmark the permalink.